Bryce Harper -- while playing right field -- even talked to Joe Buck about Cowboys QB Dak Prescott. The MLB All-Star game is all about fun this year, now that the game won’t determine home-field advantage in the World Series, and that means nobody has to take the game too seriously. Since the game is a meaningless exhibition, the league can experiment a bit with some fun new quirks. One of those quirks comes from Fox: The network is interviewing players while they’re playing. The announcers have talked to outfielders on both teams who are wearing earpieces while standing in the field. Sometimes, the conversations have been about baseball, giving fans an up-close look into players’ strategies during the game. Houston Astros star George Springer discussed what it’s like with new angles, and how he adjusts his sight lines. Other times, the conversation had nothing to do with baseball. Joe Buck and Bryce Harper—a Dallas Cowboys fan who plays in Washington, DC—talked about Cowboys quarterback Dak Prescott. Harper noted how weird the interview was in that clip—”I feel like I’m commentating on NFL Network,” he said—but he didn’t seem to mind the interviews. As long as the players don’t mind the interviews, they’re pretty cool for an exhibition like this. Reaction on Twitter was fairly positive, too. I hate all FOX in-game interviews … except when the guy is actually playing in the field at the time. That was neat. FOX is raising the bar for in-game interviews. Bravo, MLB and FOX. These in-game interviews with players are awesome. Like, actually IN-GAME. Create more personalities, stars. Creative: These live Fox interviews with OFs during play. 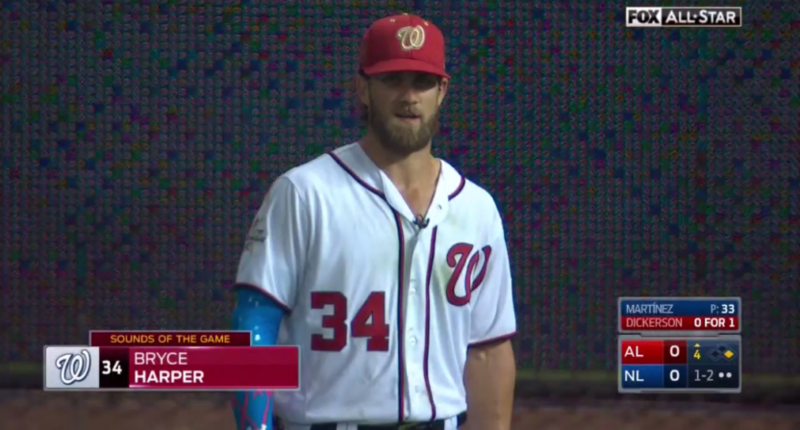 Yes, Bryce Harper – while playing RF – just asked Buck how Dak Prescott will do. In game interviews with players in the field WHILE the #AllStarGame2017 is going on. Nice touch Fox and thanks #MLB players for doing it. Love @FOXSports in game interviews! My sons are glued to what @Bharper3407 is saying! Nice touch bringing us into the game FOX! Networks do in-game interviews with players and managers in the dugout during the actual season, and those are almost universally terrible. The players and managers clearly don’t want to be talking during those interviews, and they almost never give interesting information. This is one of the few situations where in-game interviews can actually be interesting, so it’s good that they’re being used the right way. Kevin mostly covers college football and college basketball, with an emphasis on NCAA issues and other legal issues in sports. He is also an incoming law student. He's written for SB Nation, USA Today, VICE Sports, The Guardian and The Wall Street Journal, among others. He is a graduate of Northwestern University.